OK, so you’re a teenager. Right. So, now, it’s time to be part of Refuge! Refuge is a youth group for people aged school years 7 to 12, and it’s a place to get fired up for serving Jesus. But that doesn’t mean it’s only for people who already trust in Jesus… it’s also for anyone wanting to check out what the Bible says about Jesus, and to kick around the idea of following Jesus as your king and your saviour. 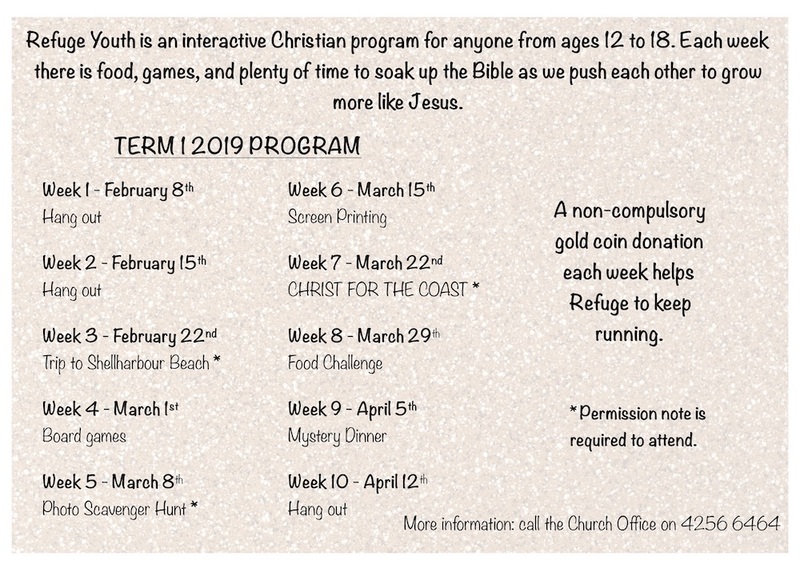 We normally meet from 7:00pm to 9:00pm on Friday nights at the church, but sometimes the times are a bit different… so see the program below to make sure. We start each week with a yummy dinner (which is provided by church member), followed by discussion time from the Bible that hits home to our lives, and we just hang out, play games and do all sorts of other stuff that you’ll have to see to believe. Give Val O’Regan, the Refuge Coordinator a call on 0408 271 189 or email val.oregan@oakflatsanglican.com. You can also ‘like’ us on Facebook – click here to see our page.